can show you how to play piano easily, without the need to read music! Welcome to The Key of One! It is my sincerest goal to teach you the fundamentals of music so that you can understand and play it regardless of your aptitude for notation. I wrote my book/DVD The Key of One expressively for that purpose and have helped students of all ages and levels achieve their musical dreams. If you have the alphabet down and can count to 12, there is no reason why you can’t fulfill your musical aspirations. And unlike reading notation, an understanding of music never gets rusty. 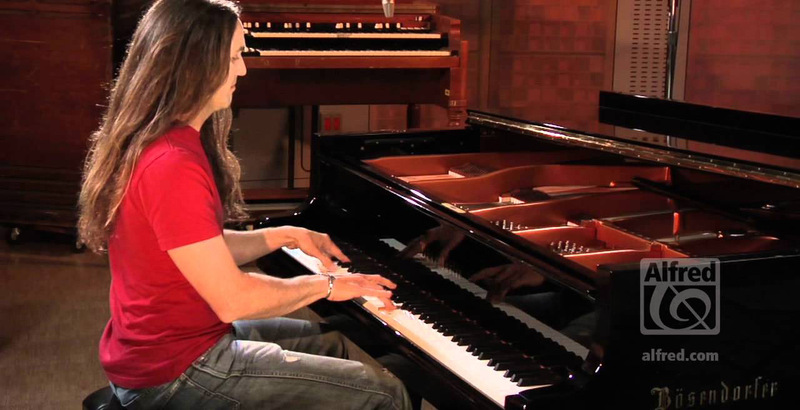 As an award-winning piano player and long time recording and touring artist, I have seen first hand what skills are truly needed by well-rounded musicians, as well as the pitfalls of missing certain fundamental skills. And as a long time teacher both privately and at Musicians Institute in Hollywood, I have encountered hundreds of students of all levels and have honed my skills down to a science. In the traditional paradigm, one was not allowed to officially learn music any way other than by reading notation, but that did a great disservice to the multitudes of students who had a great desire to play but could not grasp notation. In the 21st century, there is no reason why anyone should be denied their passion because they do not care to learn notation. Nor should anyone who learns notation be denied the understanding to be free from sheet music to improvise and create, not just regurgitate. I have had great success with my method and am looking to teach students with a passion for music and a desire to play. Teaching the fundamentals of music via the piano enables the most comprehensive understanding of music that is easily translatable to other melodic instruments such as guitar and bass. Let’s get you playing music and make your musical dreams a reality! Learn about my lesson packages, and save! I am based in Southern California will travel to your home within a 25 mile radius of the Conejo Valley, including the San Fernando Valley and parts of greater Los Angeles and Ventura counties. This includes Malibu, Thousand Oaks, Calabasas, Santa Monica, Pacific Palisades, Beverly Hills, Westlake Village, Simi Valley, Woodland Hills and more. I do Skype lessons with students worldwide and can easily set up a schedule with you. As long as you have a good internet connection, we can begin the journey to your higher musical self together. "I think music in itself is healing. It’s an explosive expression of humanity. It’s something we are all touched by. No matter what culture we’re from, everyone loves music."